SURFACE FINISH - Three quarter RMS to two RMS in hard steels and carbide to four RMS in soft steels. IN-FEED SYSTEM - is of dove tailed design with long bearing surface. 10 Pitch Lead Screw is of tool steel supported by Timken bearings. WHEELHEAD SPINDLE - is double taper design, 2-1/4” diameter, High Speed Steel, hardened and ground and running in bronze bearings. Cones are adjusted by removing dust cover and turning nut to right pulling taper cones together and setting end play with Dial Indicator measurement to less than .0001”. WHEELHEAD - Has High Carbon High Chrome Ways and one “shot” oiling system. HEADSTOCK SPINDLE - is 2-3/4” diameter, double taper bearing design with Crystal Lake Number 7 taper, carbide or high speed steel centers. High-speed steel is used in Spindles requiring a guaranteed Spindle Nose roundness guaranteed from .000025” to .000005” at an additional cost. Spindle Nose is one degree taper for holding chuck or dead center driver. Headstock is arranged for Number 5C collet up to 1”. TAILSTOCK - Spindle is of D2 steel, hardened and ground, closely fitted to bore giving tremendous rigidity without loss of sensitivity to spindle. Center is Crystal Lake Number 7 taper, carbide tipped or High Speed Steel. Dust cap holds spring, can be adjusted for tension. Hole through spindle for center knockout. DEAD CENTER DRIVER - on Headstock is a Ball Bearing design using standard ball bearings. The taper sleeve does not revolve, but the bearing revolves in its own race making, if necessary, replacement of bearing an easy operation. HEADSTOCK AND TAILSTOCK - are bored in pairs and aligned the Compensating Table, which is V and Flat design and swivels six (6) degrees either side of center. Headstock swivels 360 degrees. TABLE - is of V and Flat design mated to heavy base casting. Primary gears are helical cut wide face, having two (2) teeth in mesh, 14 pitch. Secondary gears are wide face, spur, and 12 pitch. Pinions run in ball bearings and gears run in oil. BASE CASTING - are extra heavy to dampen vibration for longer wheel life so necessary when using diamond and Borazon wheels. Tables are of ample length and weight for high finish without sensitivity. For example: The grinding of sides of control valves. 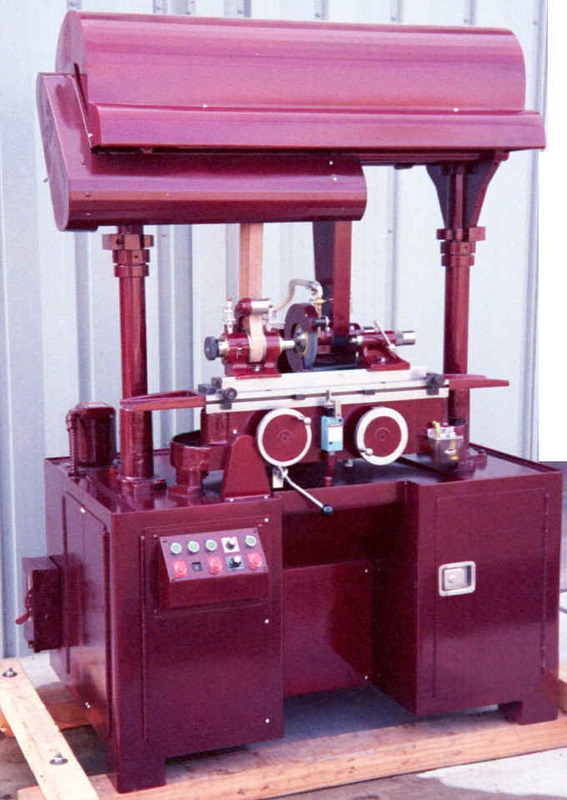 MOTOR DRIVE - is self-contained and is mounted on heavy vibration dampening cabinet with two motor drive arrangement. Headstock is equipped with 1½ hp DC Drive. Wheelhead on Model 1220 is powered by a 5 hp AC Motor standard (DC Motor Optional). COOLANT SYSTEM - over twenty five-gallon capacity, is self-contained in cabinet. Pump, with baffle plates, is rubber mounted on top of cabinet in the left-hand corner. AUTOMATIC TABLE FEED -- Has a 3000 R.P.M. Servo Drive Motor, rubber mounted, belt drive and connected to 200 to one gear reduction unit. Bull gear is steel, ¾” wide, 12 pitch, 14-1/2 degree pressure angle. Helical gears are iron, 14 pitch, 20-degree pressure angle, and 16-degree angle. Spur gears are steel, 14 pitch; 20-degree pressure angle all supported by large double or triple ball bearings. Gears dip in oil reservoir for smooth running. RADIUS WHEEL DRESSER - has an adjustable height of 4” to 7-1/2” above the table with two (2) holders for diamonds. This dresser has been designed primarily for use on Crystal Lake Cylindrical Grinders. Units are adapted with solid angle ramp. Will dress both external and internal wheels. Includes base to fit Crystal Lake Grinder, adjustable up to 12” diameter wheel radii and angle dresser with carrying case and approximately 1/3 ct. Natural Chisel Shaped Roughing Diamond. MEASURING EQUIPMENT - either electronic or air if applicable to mounting and customer choice. 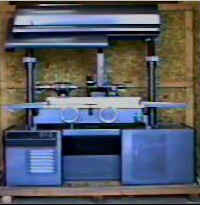 The equipment is subject to PRICE AT TIME OF DELIVERY FROM THE MANUFACTURE. POSITIVE STOP - can be mounted on hand wheel for repeatability in sizing within .000020”. FILTER SYSTEM - is mounted inside of cabinet. Overall length, inches (approx.) 65"
Overall width, inches (approx.) 36"
Overall height, inches (approx.) 96"
Distance between centers, inches 20"
Swing over table, inches 12"
Swing over standard water guard, inches 10"
Hole through spindle (inches) 1-3/16"
Diameter of Head stock spindle (inches) 2-3/4"
Diameter of Tail stock spindle (inches) 1-1/4"
Length of table (inches) 44"
Standard Grinding wheel diameter (inches) 14"
Grinding wheel width, inches 1/4" to 1-1/4"
Hole in wheel, inches 1-3/4"
DC Wheel head motor avail. OPT. Send mail to clg@netptc.net with questions or comments about this web site.